is zsu on tatra a new IAF AD regiment thing? I have watched the Zsu being tried on the valiant Shaktiman, 4 ton, and the venerable Tata 7 ton as well. The shock absorbers was what died the quickest death. So you needed ground platforms on the side so you were not translating the recoil shock via the leaf springs or shock absorbers to the ground. I think tatra either has the poles on the side or enough loha in it to stand up to the recoil. The challenge was always sustaining the recoil. So why was team firing so many rounds from M777 despite mfg restrictions? Barrels can be changed. They can be refurbished. Calibration/qualification may need to go beyond the norms or there may be stress tests. The manufacture failure mode for barrel life may be accuracy/precision (electronic fire control based) rather than actual failure. I simply don't know the details;and so i prefer not to venture judgement. The intriguing thing is that it was deemed acceptable to complete trials by firing 90 from the other gun, which may limit the kinds of info possible. I haven't heard much about the US initiative to chrome-line and retrofit existing guns. Looks interesting. Hope the indian army looks into it; and procurement agility is there to react and support if appropriate. Our needs are met by Zsu being towed to their positions. We don't have the need to keep them on the move like that. For the SP stuff we use Shilka to keep up with the front line units. Why mount the zsu 23 on a Tatra. Why not use it as a towed system. With the Tatra acting as an ammo carrier. Pratyush wrote: Why mount the zsu 23 on a Tatra. Why not use it as a towed system. With the Tatra acting as an ammo carrier. Too expensive to be towed by a tatra. Why do you need over 300 hp to do the job of what can be achieved by 125+ hp. Those 4X4 carry about the same. Light AD have tons of trucks who are bringing up the stocks. Khalsa wrote: I have watched the Zsu being tried on the valiant Shaktiman, 4 ton, and the venerable Tata 7 ton as well. I think they are just transporting it. On AD artillery, 2 quick points. 1. Israel has a single AD command supporting both the IAF /IDF. Seems like good idea for savings on training, asset optimization, single entity dealing with all threats from the sky, less bureaucracy, faster response, etc. 2. For some reason, they apparently don't use AD guns any more (willing to be corrected on this). No threats worth the insufficient 1500-2500 m bubble provided.Their AD SAM network like spyder/derby/ hawk/arrow/patriot is however, especially effective. Gun based CIWS is being used, though, as last ditch defence, more for incoming cruise / other missiles rather than fixed wing aircraft. If we follow the same doctrine, the mobile Tunguska type AD assets can be replaced by Strella / Akash batteries. Old ZSU-23 / L-70 currently used can be redeployed on LOC. As it is, One of our adversaries style themselves on the German Gebirgsjäger (mountain infantry) while coming uphill , and the Deutscher Skiverband ( Olympic Sking team) while going downhill. Well, the above mentioned AD gun works well both up hill and down hill. Indranil wrote: I think they are just transporting it. Most senseble comment on the zsu thing. Would love to agree with IR but I have seen many COs trying to hack the Zsu into a SP unit because they want to remove down time of unhooking and and prepping it to fire. Zsus always move on wheels. Please look out for news about Electronic fuzes from BEL unit in Pune. Should have commenced production by now. ramana wrote: Please look out for news about Electronic fuzes from BEL unit in Pune. So far, with 1.5 lakh units made at its plant in Pune, BEL hopes to make a similar amount on an annual basis at the proposed unit in Nagpur. As of 18th July 2018. Thanks. Very good idea to have the new factory at Nagpur as it minimizes the road travel loads on the filled fuzes. Also the emphasis on 105mm fuzes shows how many of those guns and ammo is in inventory. Wonder if same fuze can be fitted into different shells. 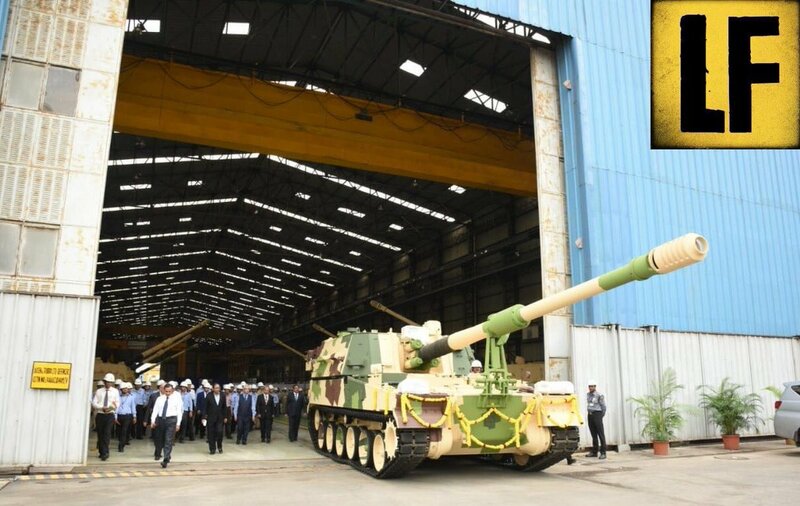 https://twitter.com/livefist/status/1025812347766624257 ---> A K9 Vajra-T tracked howitzer from L&T’s Hazira assembly facility rolls in this picture from Thursday. Part of the first batch that’s all set to be delivered to the Army next month. Full report up this week. Finally, Gun Carriage Factory, Jabalpur (GCF) obtained green signal for handing over first lot of six ‘Dhanush – 155’ guns to the Indian Army, on Saturday. Director General (Artillery), Lieutenant General P K Shrivastava congratulated the management and team of GCF for successful trials of Dhanush-155 at Pokharan (Rajasthan) and directed for preparing the guns for handing over to the Indian Army. Earlier, DG (Artillery), Lieutenant General, P K Shrivastava, accompanied by GCF, Senior General Manager, S K Singh, representatives of other units, including Controller Quality Assurance (Weapons), Director General Quality Assurance (DGQA), Bharat Electronics Limited, Bengaluru, OF Ambernath etc. involved in Dhanush Project, conducted visit of Dhanush production unit and sought information about progress in development of more guns. He interacted with the officers engaged in production and overhauling of Dhanush-155. In second phase of the inspection, Lieutenant General P K Shrivastava chaired a review meeting of Dhanush Project. He applauded the efforts of GCF administration and other supporting units for successful upgradation of Swedish Bofors gun and enhancing its firing efficiency. He directed the officers to complete overhauling of six guns and starting preparation for handing over to the Indian Army. He also directed the officers to start production of 12 new guns and sought information about preparations and materials procurement. Last edited by krishna_krishna on 05 Aug 2018 02:10, edited 5 times in total. Added Later: Thank You Krishna. Greatly appreciated. https://twitter.com/SJha1618/status/1025850491736010752 ---> I think OFB should be able to deliver twelve 155 mm Dhanush howitzer units to the Army in the next fiscal once bulk production clearance is awarded post general staff evaluation. Great news on Dhanush. Delivered 6 and order for 12 more. Wow, three type of 155mm artillery guns getting delivered to army within the same quarter is simply amazing!! The Hitavada site has quite a few artillery reports! ANOTHER indigenously developed gun system ‘Soltam-155’ at Gun Carriage Factory (GCF), Jabalpur, is awaiting nod from the Ministry of Defence (MoD) to kick-start its production. GCF has given a tough contest to other gun systems developed by two private companies and emerged on top with fulfilling technical parameters recommended by the Indian Army. GCF Senior General Manager S K Singh, while talking to ‘The Hitavada’, confirmed that indigenously developed gun system with upgradation of Russian 130 mm gun named ‘Soltam-155’ passed through rigorous user trials and awaiting green signal from higher authorities to start its production. Two prototype guns were developed on recommendation of the Indian Army and handed over for testing of their technical parameters in Field Evaluation Trials (FET). He is hopeful to get production order for Soltam-155 in next 4 to 6 months. Gun Carriage Factory (GCF) in collaboration with Ordnance Development Centre, Kanpur, and Ordnance Factory Kanpur successfully completed upgradation of Soltam gun. The factory has upgraded Israel made 130 mm Soltam gun that was procured by the Indian Army from Russia. Upgradation of 130 mm Russian gun is a part of research and developments being carried out at Gun Carriage Factory. production order from the Ministry of Defence. Gun Carriage Factory has already proved its mettle by indigenously developing longest firing Dhanush-155/45 calibre gun and eyeing positive nod from Ordnance Factory Board to register its strong presence against private firms in production of best defence weapons for the nation. “BEING one of the oldest weapon manufacturing units in the country, Gun Carriage Factory (GCF) Jabalpur has proved its mettle with indigenous development of world’s longest firing ‘Dhanush-155 gun. Along with Dhanush, GCF is also developing some new guns of variant uses with rigorous research and development works. Pride of Jabalpur, Dhanush Gun will be serving the nation for a long time to come,” informed Senior General Manager of Gun Carriage Factory Jabalpur S K Singh, while addressing a press conference on Friday. The 114-year-old GCF has now unmatchable expertise in indigenous production of weapons to strengthen armed forces on national borders. Indigenous artillery gun will take India out of perpetual import and foreign dependency for artillery gun. GCF Senior GM S K Singh informed that reliability in the field of functioning was an area of concern which has been addressed in last one year. During last 2 trials of Dhanush, one at PXE Balasore and another at Pokharan user exploitation. In last user exploitation trial at Pokharan, gun system successfully completed battery firing comprising 6 guns at Pokharan on June 7.
and the 4.5 inch gun for the Navy. the team which successfully developed the proximity fuzes for 75/24 Howitzer shell. provided tremendous impetus to the progress of the project. Road but unfortunately no success on VT fuzes had been achieved. conjunction with shell body would work as a quarter wave monopole antenna. estimated to be several thousand gs. applications, as no other fuze was known to have used a single cell system. months period and tested it at PXE, Balasore against a standard metal sphere. imported fuzes. Nine of ten fuzes functioned in the proximity of the spherical target. A question for those with knowledge of the M777. Which parts of it are made of titanium alloy? I guess the trails and carriage. Thanks. So they use net shape castings using investment casting technology to reduce machining and welding time. And TI alloy for weigh reduction. OFB can use similar techniques with steel castings which is easier metallurgy than Titanium to realize mfg savings. Eg:3D printed molds for Sand casting high strength steels. MoD approves production of 150 ATAGS at 3400 crores. Indian MIC is on it's way. FLASH: MoD approves acquisition of 150 @DRDO_India Advanced Towed Artillery Gun Systems (ATAGS) for the Indian Army at a cost of ₹3,400 crore. And as expected, the Defence Acquisition Council of India's Ministry of Defence has cleared the procurement of 150 @DRDO_India developed ATAGS 155 mm / 52 calibre howitzers for the Indian Army @adgpi . ATAGS, as you know, boasts next generation capability. The order value at the approval stage is Rs 3,364.78 crores for the 150 @DRDO_India developed 155 mm / 52 calibre ATAGS howitzers. The DAC granted approval to a few other proposals amounting to approximately Rs 24,879 crore, which included approval for procurement of 150 numbers of Indigenously Designed and Developed 155 mm Advanced Towed Artillery Gun Systems for the Indian Army at an approximate cost of Rs 3,364 crore. These guns have been indigenously designed & developed by DRDO and will be manufactured by production agencies, as nominated by DRDO. nam wrote: MoD approves production of 150 ATAGS at 3400 crores. Major brown pants in Rawalpindi. Ah4, m777 equivalent, seem to have a little generator to power the movement of supporting arms. They managed to sell to Kuwait! Chinis don't have SP towed artillery, like our ATAGS. They do have small truck mounted 155/52.